The good news: The Seahawks don’t have to play in Denver and Chicago during the winter. The bad news: They have to open with consecutive road games. The opener in Denver and the Monday night game in Chicago in Week 2 mark the third time since 2011 the Hawks have started with two straight road games. They opened 0-2 in both 2011 and 2015. 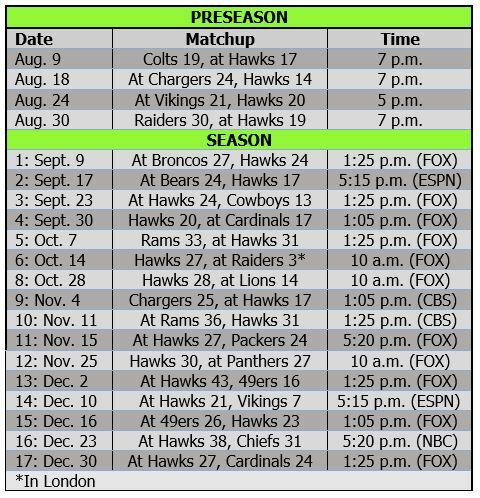 Seattle’s 2018 schedule is weighted toward road games early and home games late: The Seahawks play five of the first seven on the road and four of the final five at home (three in prime time). They have five prime-time games — four in Seattle, where the Hawks are 17-2 in night games (including playoffs) under Pete Carroll. They are 26-5-1 in prime time overall under Carroll. Seattle has three 10 a.m. games — in London vs. Oakland in Week 6, at Detroit in Week 8 and at Carolina in Week 12. The Seahawks are 10-11 in 10 a.m. starts (playoffs included) since Russell Wilson arrived in 2012, but they have won four of the last six. The bye is well-placed in Week 7 — the latest they have had a week off since 2015. Their byes since 2012: Week 11, 12, 4, 9, 5, 6, 7. The storyline: These teams have changed a lot since the Seahawks blew out the Broncos in the Super Bowl four years ago. The Broncos are on to their fourth QB since Peyton Manning retired, with John Elway hoping Case Keenum can replicate his breakout year in Minnesota. The Broncos just cut C.J. Anderson, so they need to find a running back to go with Devontae Booker. They still have a good defense, even after trading Aqib Talib, so they obviously hope a revamped backfield will put them back on the right side of .500. If Keenum can get synced up with Demaryius Thomas and Emmanuel Sanders, the Broncos will be tough to beat in Denver. The storyline: The last time these teams met in Chicago, in Wilson’s rookie year, the QB keyed an overtime win that showed Pete Carroll he could take the restraints off Wilson. Then the rookie led the Hawks to the playoffs. Last year, the Bears found their franchise QB, they hope, in No. 2 overall pick Mitch Trubisky. Then they brought in a bunch of new weapons this offseason: WRs Allen Robinson and Taylor Gabriel and TE Trey Burton. This is an odd game to place on Monday night, but it helps Seattle avoid a 10 a.m. start. Seattle is almost impossible to beat in prime time. The storyline: The Cowboys come to Seattle this year after losing 21-12 at home last season in Justin Coleman’s “Kettle Jump” game. The Cowboys have scored 12 points in both recent losses to Seattle, including a 13-12 defeat in 2015. The big story for this one might end up being Earl Thomas, if he does get traded to the Cowboys and joins Kris Richard in Dallas. The Cowboys otherwise will have a new look on offense, with Allen Hurns replacing Dez Bryant as the No. 1 receiver. The Cowboys’ success will rely largely on their offensive line and Zeke Elliott. The storyline: As Larry Fitzgerald enters his 15th and final season, he will be playing for his fourth coach and catching passes from yet another QB. Bruce Arians and Carson Palmer retired, replaced by Steve Wilks and Sam Bradford. The offense will be run by Mike McCoy, and backup QB Drew Stanton has been replaced by Mike Glennon; it will be interesting to see which QB ends up throwing to Fitzgerald in this one. The Cards also shuffled their O-line, trading Jared Veldheer and signing Andre Smith and Justin Pugh. And they get David Johnson back after he missed most of 2017 with an injury. The Cards’ defense should remain strong, even after they cut Tyrann Mathieu. Assuming he makes Seattle’s roster, ex-Card WR Jaron Brown should be up for this one. The storyline: Sean McVay had a stellar debut as Rams coach, leading them to the NFC West title as Todd Gurley had a resurgent season and Jared Goff took a big step forward. The Rams look even stronger this year, after loading up with defenders Marcus Peters, Aqib Talib and Ndamukong Suh and receiver Brandin Cooks. As if Aaron Donald and company needed more help to beat the Seahawks. The Rams destroyed the Hawks in a big game in Week 15 last season, basically knocking the Hawks out of the playoffs and kickstarting this offseason of upheaval in Seattle. Wilson is 4-2 against the Rams in Seattle, but that 42-7 debacle last year is hard to forget. The storyline: The NFL has been playing in London for 11 years, and now the Seahawks finally are being forced to take their turn. The Hawks play at home the previous week, so they will just go over the pole from Seattle to London — it’s only an hour longer flight than if they had played on the East Coast (Carolina) and left straight from there. This will be Jon Gruden’s sixth game back in the NFL after a decade in the TV booth. Can he perform his magic with Derek Carr and company? The Hawks could see a couple of very familiar faces in Marshawn Lynch and Bruce Irvin. The storyline: The Seahawks will see a couple of longtime teammates in this one — Luke Willson and DeShawn Shead. New coach Matt Patricia brought in a couple of ex-Pats, RB LeGarrette Blount and backup QB Matt Cassel, and obviously will try to mimic the Patriot Way. It starts with Patricia getting Detroit’s defense turned around. The Seahawks are 4-2 with Wilson after their bye weeks, and have won their last two post-bye road games. The storyline: Anthony Lynn seems to have the Chargers going in the right direction — last year’s team was maybe the franchise’s best since 2010. If Philip Rivers can keep going strong at age 36, the Chargers might be able to win the AFC West. When these teams met in 2014, Rivers and Antonio Gates burned the fatigued Seattle defense for three TDs on a scorching day in San Diego. The weather for this Seattle game should be much cooler, and if it’s raining (as it often does in November), former Hawks Russell Okung and Brandon Mebane and the rest of the Chargers could have a tough time. The storyline: If the Rams return as strong as everyone expects, the Hawks will have a tough time keeping up with them. Wilson is 2-4 at the Rams, including 1-1 in L.A. 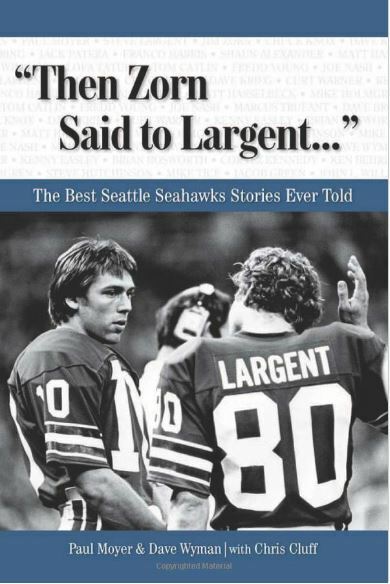 The storyline: The Seahawks will play the Packers, their adopted division brothers, for the seventh time in seven years. The Seahawks will be happy to be home for this one — they have lost eight straight in Green Bay, including last season’s opener. This game will feature the return to Seattle of Jimmy Graham, who signed a three-year, $30 million deal with the Packers. Graham figures to pick up the production of Jordy Nelson, the longtime Green Bay receiver who was released and signed with Oakland. If Aaron Rodgers stays healthy, the offense will be dangerous, as usual. The defense has been bad the last few years, and the Packers replaced Dom Capers with Mike Pettine this year. The personnel is largely the same though, so the Packers will be relying on Rodgers, as always. The home team has won each of the five games since Wilson became Seattle’s QB. The storyline: Like the Packers, the Panthers really are a division foe for Seattle. The teams took a break last year after meeting seven times in the previous five seasons, but they get back to it this year. Wilson is 5-2 (counting playoffs) against Cam Newton, 3-1 in Charlotte — although the loss came in the last visit, ending Seattle’s playoff run in 2015. The Panthers have tweaked their offense this offseason, cutting Jonathan Stewart and adding receivers Torrey Smith and Jarius Wright. They also moved on from DE Charles Johnson, but they added Dontari Poe, and Julius Peppers is still going at age 37. The Hawks play scrappily well in Carolina, so we’ll give this to Wilson & Co. The storyline: Richard Sherman will be looking to make Pete Carroll pay after Seattle unceremoniously dumped him, and he will do it in prime time. Second-year coach Kyle Shanahan and QB wunderkind Jimmy Garoppolo led the Niners to five wins to finish the 2017 season, and they will look to build on that. Some think the 49ers will be better than the Seahawks in 2018; this game will show the truth of that. Beyond Sherman, the 49ers have a handful of other former Seahawks, including Malcolm Smith and Cassius Marsh. And the defense, potentially without Reuben Foster, is run by former Seattle assistant Robert Saleh. So this one basically will be Seahawks vs. ex-Seahawks. Wilson is 7-0 at home vs. the 49ers, so Jimmy G will have his work cut out. The storyline: These teams haven’t met since that frigid and fluky playoff game two years ago. Blair Walsh helped lose that game for the Vikings, then he helped lose three for the Hawks last season — and now he’s looking for a third team. These teams, who once notoriously “swapped” Steve Hutchinson for Nate Burleson, kept up their odd player exchange this offseason with some defensive tackle moves — Sheldon Richardson signing with the Vikings and ex-Vikes Tom Johnson and Shamar Stephen coming to Seattle. After letting their three quarterbacks go and giving Kirk Cousins a fully guaranteed $84 million, the Vikings are expected to be strong contenders in the NFC. Wilson is 4-0 against the Vikings, and it should help that this game is in Seattle and in prime time. The storyline: The 49ers haven’t beaten Seattle since 2013, and Seattle has won four straight in the Bay Area. But, if the 49ers, are as improved as everyone thinks they will be, they should be able to end that losing streak. The big question: Will either of these teams be in the hunt to win the division at this point? The storyline: The Patrick Mahomes era is about to begin. The Chiefs traded Alex Smith to Washington to make way for their 2017 first-round pick and then brought in Sammy Watkins to be his No. 1 receiver. Meanwhile, KC’s secondary has been revamped, with Marcus Peters traded to the Rams. These teams have not met since Seattle’s controversial loss in Kansas City in 2014 (a no-call on blatant interference vs. Doug Baldwin in the end zone late in the game). At home, the Seahawks should take advantage of Mahomes’ inexperience (although he will have started almost a full season by this point) and KC’s remade secondary. The storyline: The Seahawks have lost at home to the Cardinals three straight years and in four of the past five. Arians much preferred playing the Hawks in Seattle. 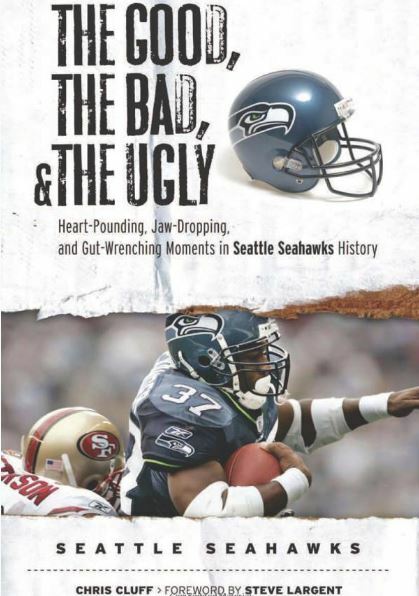 This is the second straight year these rivals will finish the season in Seattle; last year the Hawks committed 100 yards in penalties and converted just 1 of 12 third downs in a 26-24 defeat. 12 wins! I have 8 or 9, with Russell all that stands between them and worse. Mainly, I can’t this team winning 5 road games, even though I see your logic for each individual game. And I don’t think that they are talented enough to dominate at home. Haha. I told you I was being optimistic. I’ve got ’em at a base 8-4, with four tossups (DET, GB, CAR, MIN). Say they split those — still 10 wins. One projection has them with 6 wins. Geez, an ambulatory RW will get 8. I’m less concerned with Ws than with pulling out of the offensive malaise of the last two seasons. I think that will happen — it’s a matter of how long it takes them to gel. The moves Schneider has made will look better on the field than on paper. Re the defense, there’s a lack of playmakers, especially if Earl is traded. Vita Vea would look awfully good on this team. It’s contrary to Schneider’s approach to trade up, and I don’t know how he’d do it, but I can dream!